Our home for our week on the Isle of Lewis was The Decca, owned by Pete and Louise. We couldn’t have picked a better location and couldn’t have been made more welcome. 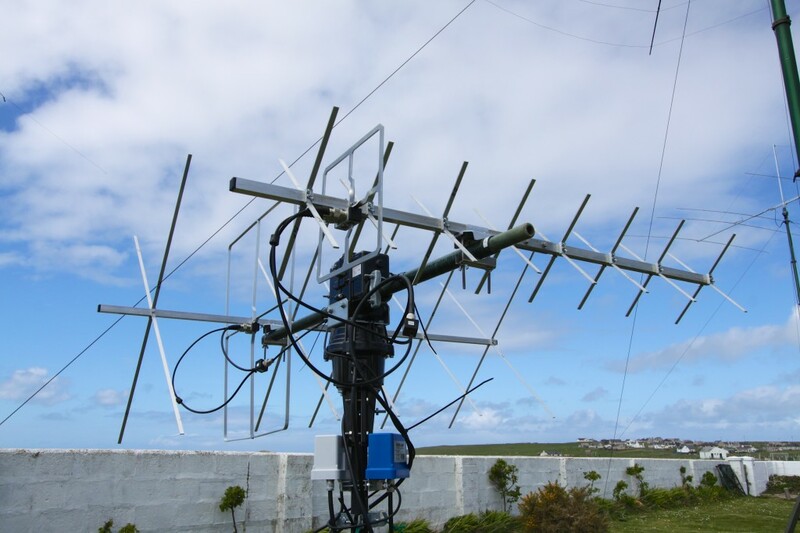 We did wonder if 13 radio amateurs arriving with so much equipment, taking over the garden for antennas and ‘re-modelling’ the houses for the shacks, would have been too much for our hosts – but we couldn’t have been more wrong. We were welcomed by Pete and Louise when we arrived and told to do whatever we needed to do to make our trip a success. 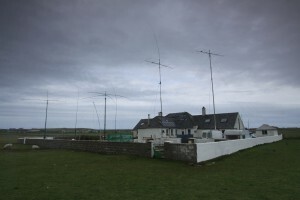 They let us take down all of the washing lines in the garden, so that we could guy the masts, they turned a blind eye when we distributed the living furniture around the house to make room for the HF stations, they laughed and got used to their touch-switch bedroom lights going on and off in the middle of the night when we went on 80m and they switched off their solar panels and everything else in the house when we tried to find the source of some noise (it was one of our own laptop power supplies). It was excellent accommodation, in a great location, with fantastic hosts. We’d like to thank them for their hospitality and recommend that any other groups going to Lewis give them a call. Before it’s retirement in 2000, The Decca was part of the Hebridean Chain of the Decca Navigation System. The Decca Navigator System was a hyperbolic radio navigation system which allowed ships and aircraft to determine their position by receiving radio signals from fixed navigational beacons. The system used low frequencies from 70 to 129 kHz. It was first deployed by the Royal Navy during World War II when the Allied forces needed a system which could be used to achieve accurate landings. After the war it was extensively developed around the UK and later used in many areas around the world. 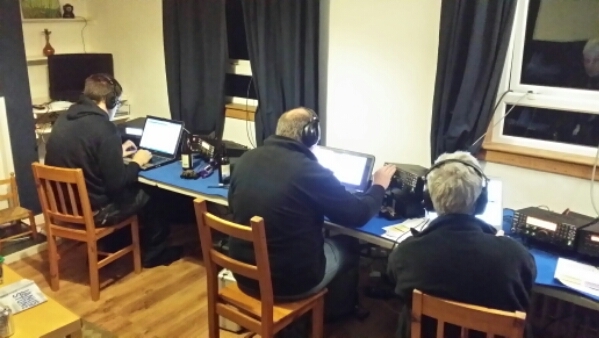 We were visited by many local and visiting radio amateurs during the week, just wanting to say hello, swap stories and see what we were doing. On our last day, we were really lucky to be visited by a very interesting local resident, Norman Smith from Lionel, Ness. 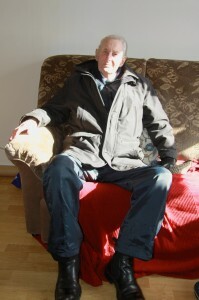 Norman worked at the Decca station for all of its operational life from 1954 to 2000 after being a ships radio officer. He told us about the 185 foot masts which were at the station and the 300 foot mast which was nearby. He explained that the main house in the centre of the building used to be the main radio operations building, with the houses either side being accommodation for the Station Engineer and the 2nd Engineer. He was able to tell us about the earth mat which is still below the ground which we had been wondering about all week. It was really nice to meet Norman, who celebrated his 90th birthday with a meal at The Decca a few weeks earlier, and we’re very grateful that he took the time to come a visit us. 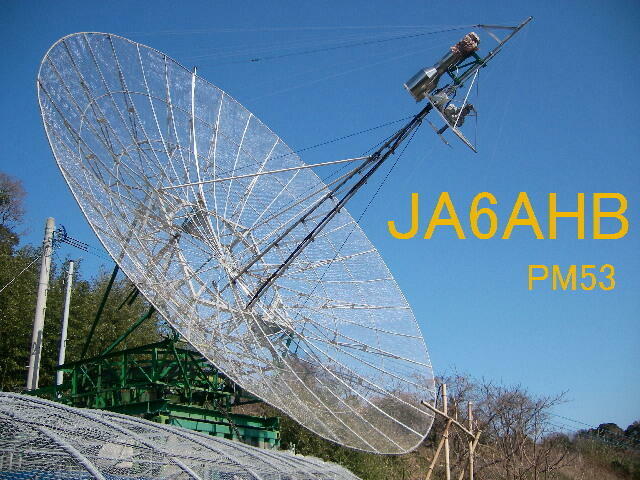 One of the 23cm EME stations I worked was Toshio JA6AHB. 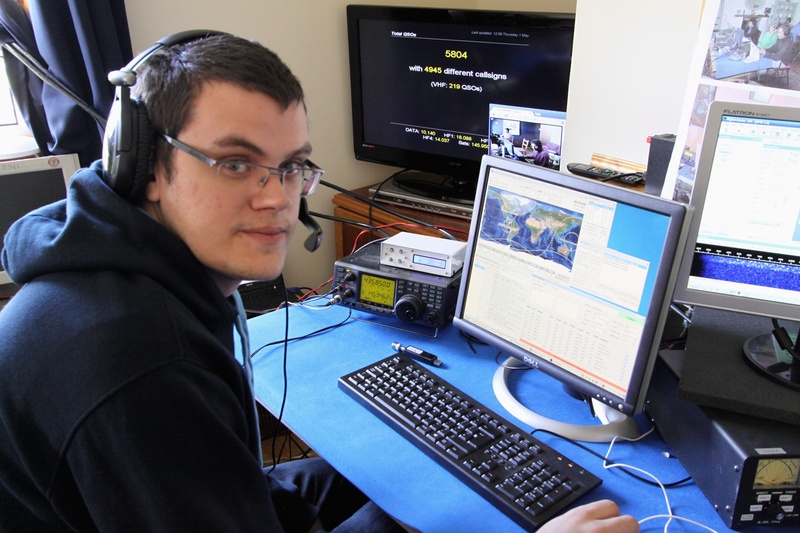 Toshio has very kindly donated £20 to the Camb-Hams in thanks for his QSO with GS3PYE/P in IO68. This is totally unexpected but gratefully accepted towards the cost of the trip. 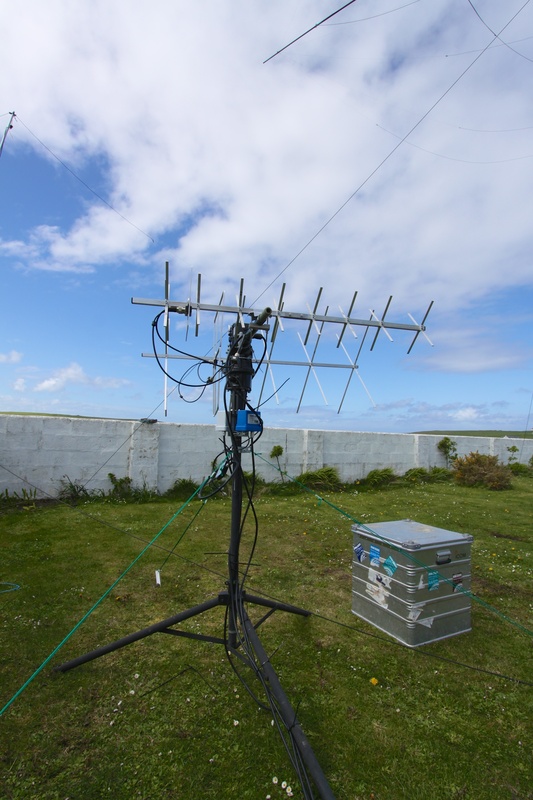 This year again, we have the higher band stations based in Flossie. 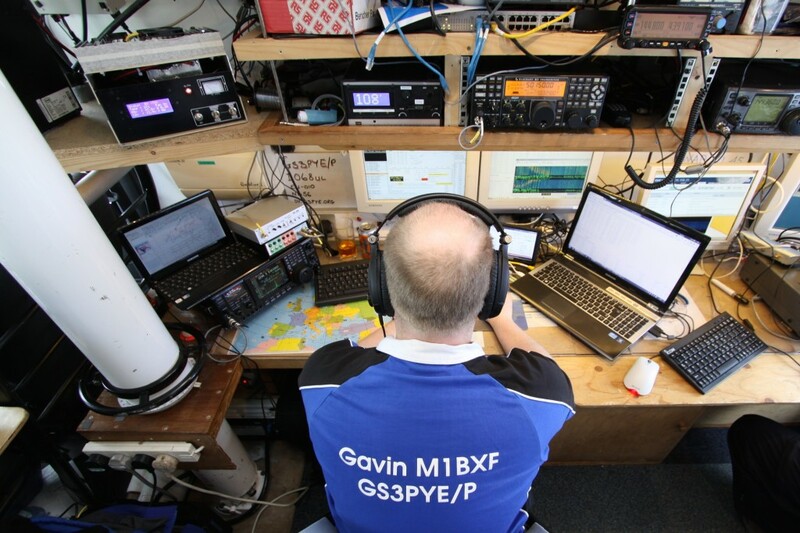 Gav M1BXF and John G4BAO both put in many weeks of preparations for that stations before we left for Lewis and the photographs below show just how much equipment they brought to support the 6m, 4m, 2m & 23cm stations. There are also frequent dashes outside to cover the various pieces of equipment when the rains comes. This is Gav and John covering the 23cm EME equipment in some very strong winds. 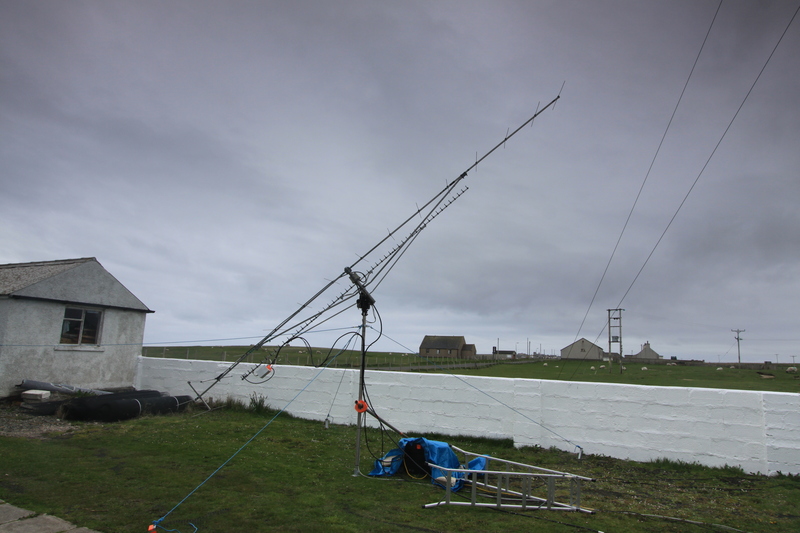 You can see the bend on the 2m and 23cm EME beams as the wind blows in from the left. 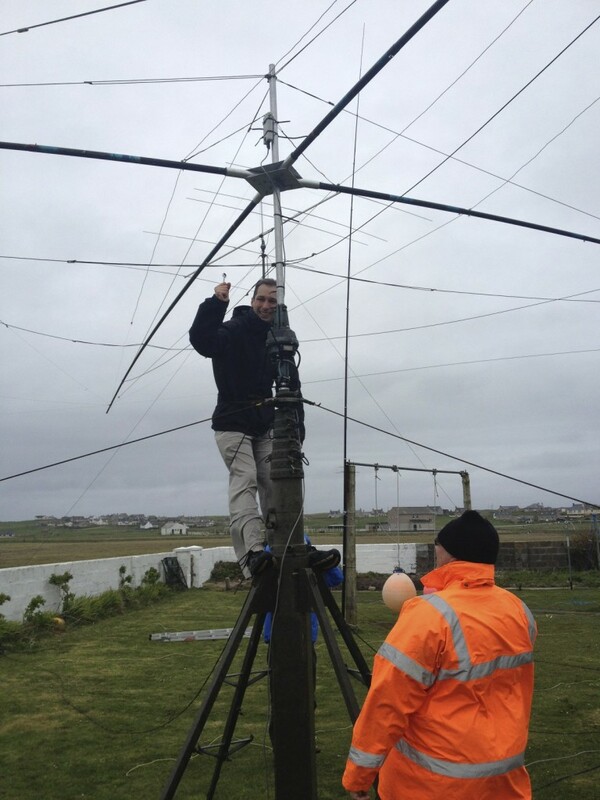 John G4BAO spent a long time preparing the Earth-Moon-Earth (EME) 2m and 23cm systems before we left Cambridge and now he’s in his element working people ‘off the moon’ from the Isle of Lewis. 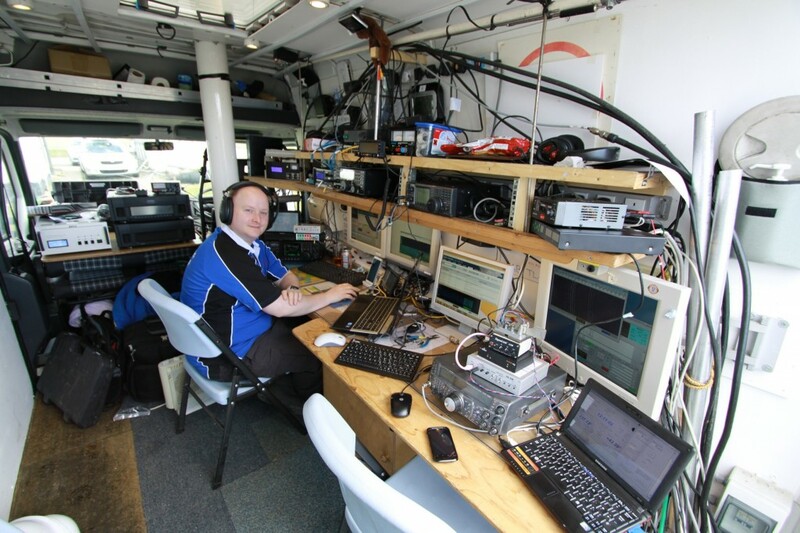 John G4BAO operating the 2m and 23cm EME system in Flossie, with the 6m and 4m stations to his left. 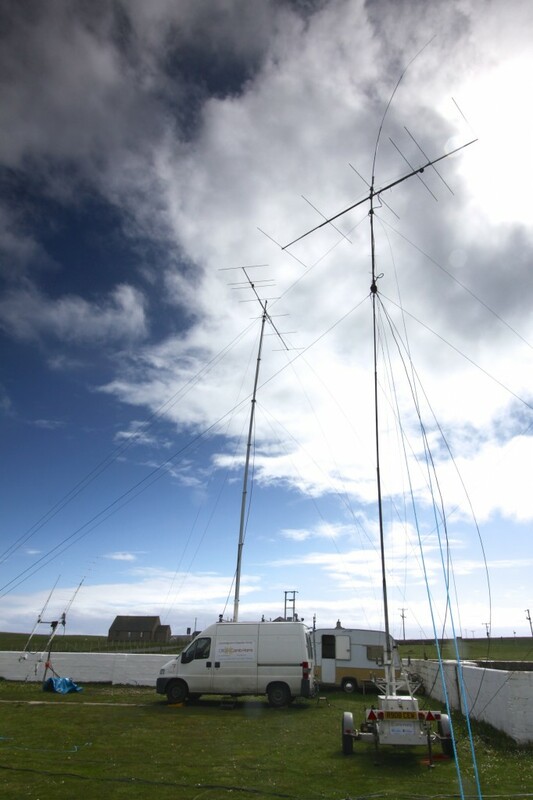 GS3PYE/P 2m and 23cm EME antennas in operation on the Isle of Lewis. 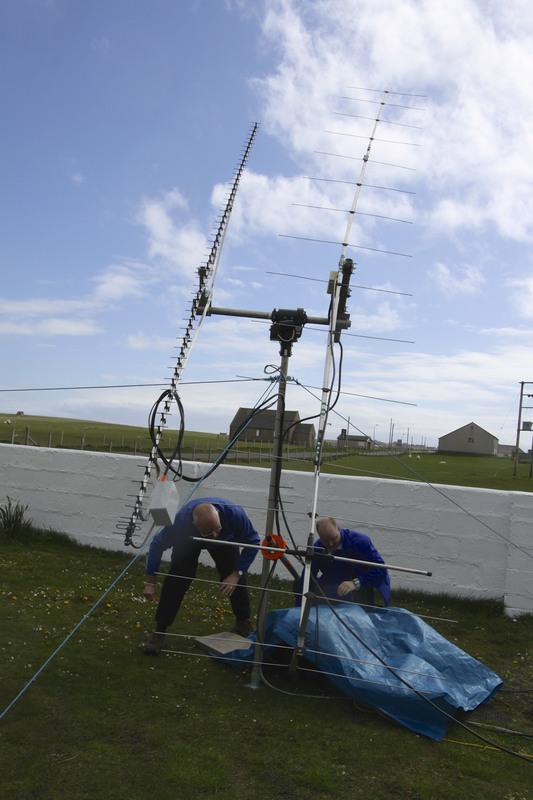 We came to Lewis with a low ERP 23cm EME system with hopes of making a handfull of QSOs. We up till now we have 9 EME initials on 23cm with a few days to go. 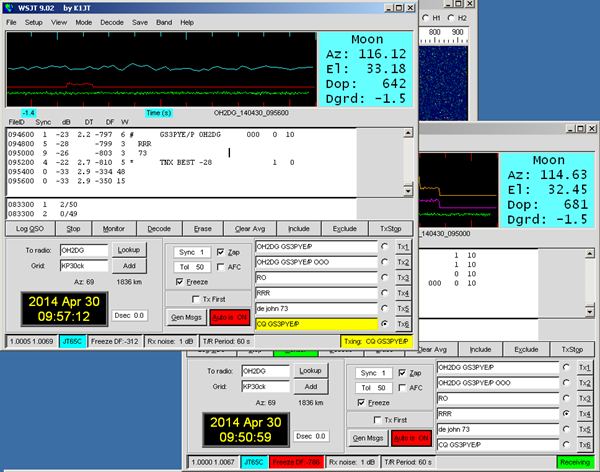 Here are a couple of screenshots of some of the QSOs. 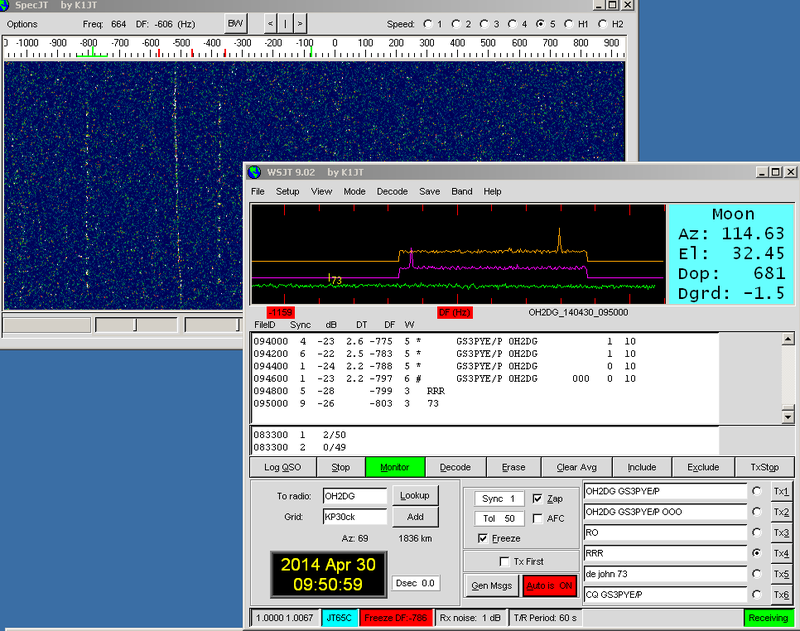 2m EME has been impossible due to local high noise levels on 2m. 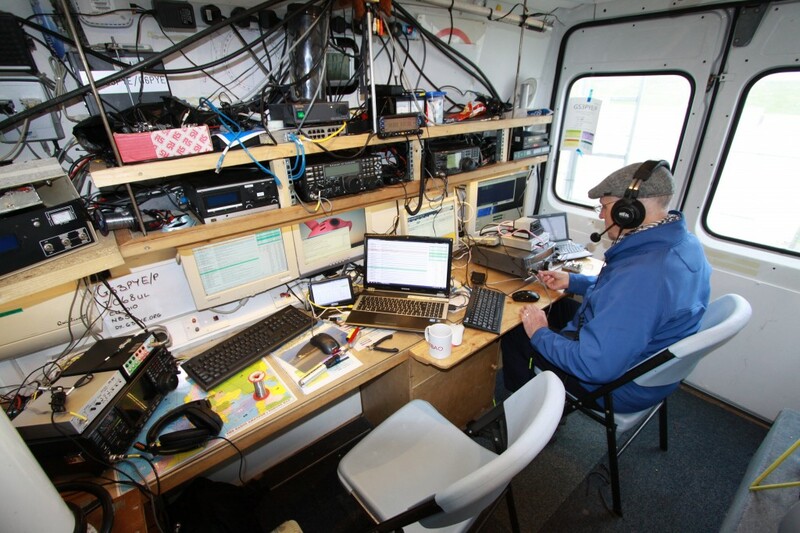 Photographs from our GS6PYE/P activation of the Shiant Isles (EU-112) on 28 April 2014. 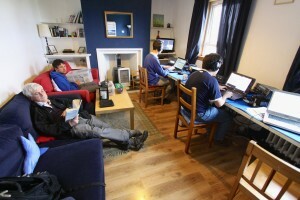 The operators were Dom M0BLF, Rob M0VFC and Steve M1ACB. The radios were a pair of Icom IC-706MkIIG’s. The antennas were a quarter wave vertical for 20m and a vertical dipole for 15m. We made 1136 contacts on the 20m and 15m bands. There’s a cold, blustery wind on the Isle of Lewis today and we noticed the Spiderbeam spinning on the mast when we got up this morning. So, the working party went out before breakfast to lower the mast, remove the Spiderbeam, remove the rotator, replace the Spiderbeam and put the mast back up again. 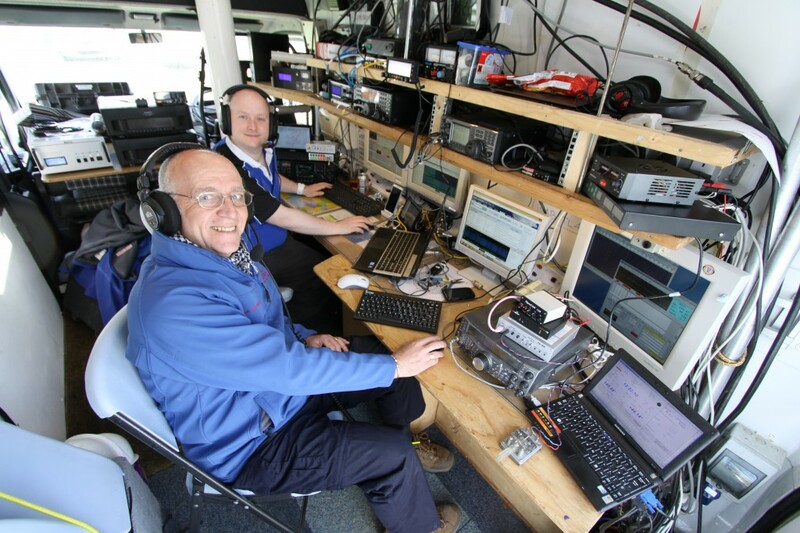 A few more adjustments were necessary to the mast holding the 15m beam, but all is well now and we’re on the air again from most of the stations. Everyone inside again for coffee and bacon rolls. 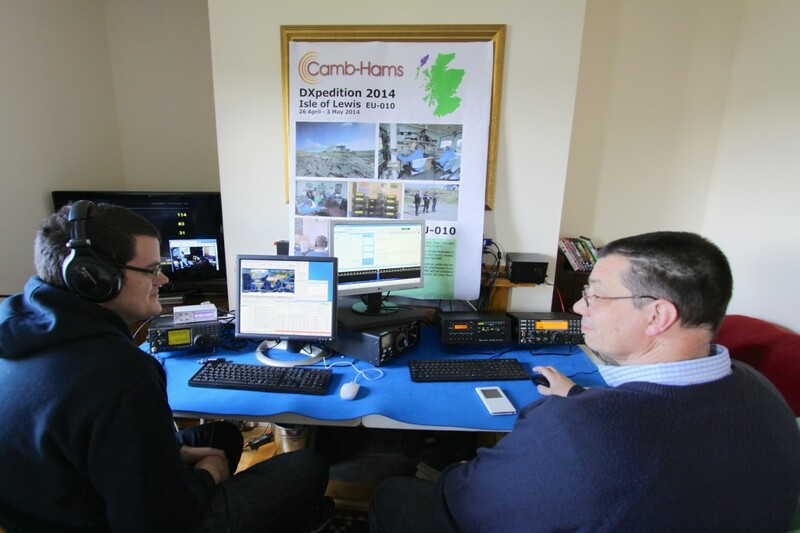 This is the the room used as the main HF operating, typically SSB. The Decca is symmetrical with opposite layouts at each end of the building. 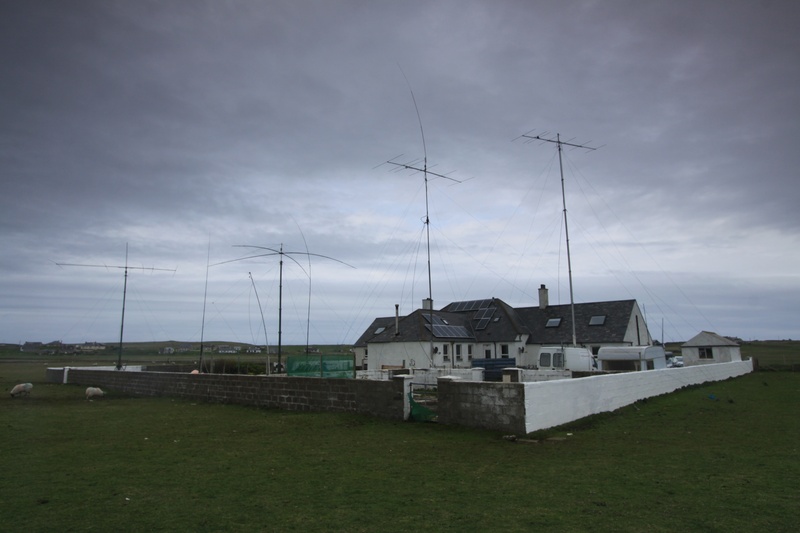 At the other end, in the opposite room, is another HF station mainly used for CW, an HF data station and the VHF/UHF satellite station.